Ibn Haitham or All real name Abu Muhammad al-Hassan Ibn al-Haitham, or wise men in the West, he is known as Alhazen, was an Islamic scholar who is an expert in the field of science, astronomy, mathematics, geometry, medicine, and philosophy . He also did a lot of investigation into the light, and has given inspiration to western scientists like Boger, Bacon, and Kepler in creating the microscope and telescope ..
Islam is often given image as a backward religion and rewind. Islam also said not to encourage his people demanded and master various sciences field. The reality and the picture given is not only not true but conflict with the actual history. History has proven how much of the Islamic world has produced many scholars and scientists group was simply superb in the field of philosophy, science, politics, literature, society, religion, medicine, and so on. One characteristic that can be seen in the figures is that they are not Islamic scholars simply can master the art at a young age, but in a short time to master multiple disciplines simultaneously. Although it's more recognizable figures in science and medicine but he also has a high proficiency in the field of religion, philosophy, and so on. One of the character than is Ibn Haitham or All real name Abu Muhammad al-Hassan Ibn al-Haitham. In the wise men of the West, he is known by the name of Alhazen. Ibn Haitham was born in Basra in 965 AD along with the 354H. He started his early education at Basrah before sworn in as a government employee in his native port. After a while submissive with the government there, he took the decision to migrate to Ahwaz and Baghdad. In the colony he has continued teaching and concentrating on writing. His passion for science has brought emigrated to Egypt. While there he had taken the opportunity to do some investigative work on the flow of the Nile River and drains as well as copying of books on mathematics and astronomy. The goal is to get the money back on the way to the University of Al-Azhar. Results rather than effort, he has become a very proficient in science, astronomy, mathematics, geometry, medicine, and philosophy. The writing on the eyes, has become one of the important reference in the field of teaching science in the West. In fact, her study of the treatment of the eye has been a principle to the study of modern medicine on the eye. Ibn Haitham is a scientist who likes to do the investigation. Investigation of the light has given inspiration to western scientists like Boger, Bacon, and create a microscope and telescope Kepler. He was the first person to write and meet various important data about the light. Some of the books he wrote about the light has been translated into English, which is Light and On Twilight Phenomena. Membahaskan many studies about dusk and halos around the moon and the sun and shadow, and the eclipse. According to Ibn Haitham, the light of dawn begins when the sun is on the line 19 darjah on the eastern horizon. The red color in the evening too would be lost if the sun is in the line 19 darjah western horizon. From his studies, he has also been successful as a light position bias produces light and reversing light. Ibn Haitham also participating in the percubaan the glass burned and thence terhasillah theory magnifying lens. The theory has been used by scientists in Italy to produce the first magnifying lens in the world. Even more amazing is that Ibn Haitham has met the content cohesive principle of air before a scientist named Trricella know that 500 years later the case. Ibn Haitham also met kewujudan pull of gravity before Newton Issaac know. Moreover, the theory of Ibn Haitham about the human soul as a series of feelings in a row on a regular basis has given inspiration to western scientists to produce a puppet figure. His theory led to the discovery of a film that later joined in a row and played to the audience as we can tontoni today. In addition to science, Ibn Haitham also wrote about philosophy, logic, metafizik, and issues relating to religion. He co-authored the review and summary of the works of earlier scholars. Many philosophical writing is concentrated on the aspect of truth in matters of dispute. Dissension and schism her case about something berpunca than the approach used in recognized. He also argues that free is only one truth. Therefore all reasonable charges diragui truth in assessing all views are available there. Thus, his view of the philosophy is very interesting to highlight. 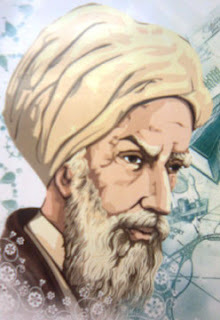 For Ibn Haitham, philosophy can not be separated rather than mathematics, science, and divinity. All of the three fields and disciplines should be mastered and to hang someone that needs to use his youth to the fullest. If age is increasing, and mental strength will help fizikal decline. 6. Minutes of Sina'at fi al-Syi'r about poetry writing techniques. Ibn Haitham donation to science and philosophy very much. Kerana that Ibn Haitham recognized as a poor man but rich in terms of material science. Some of the views and opinion is still relevant so to this day. Camera Obscura (the Latin for dark room), the development of Ibn Al Haitham findings are based on the principle of capturing light reflected from an object. Nevertheless partly his longer had "stolen" and "diceduk" by Western scientists without providing a reasonable appreciation to him. Indeed west should thank Ibn Haitham and his deep Islamic scholars without their chances European world was covered with darkness. Ibn Haitham studies have provided the foundation for the development of science and at the same time his writings on the philosophy of thinking has proved the authenticity of Islamic scholars in the discipline are no longer shackled by the thought of Greek philosophy.